14 Cups Water Make sure you use cold water. Cut garlic into small pieces. Cut kale into very, very thin pieces. Set the stove on high and using a deep pot, add olive oil and garlic. Let it simmer for 2 minutes. Add water, chicken cubes, and corn meal. Mix until corn meal is dissolved totally. Add a tablespoon of salt and the chopped up pieces of kale and stir consistently until the water is boiling. Be careful once the boiling point is reached as this mixture will begin to bubble and spit. Lower the heat every 5 minutes and continue stirring. Cook for 1 hour. Corn meal can be eaten hot or cold. Once cold the mixture will become hard. Before frying, let mixture rest for one day. 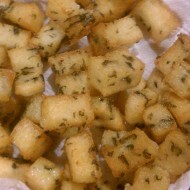 Cut corn meal into square blocks and deep fry them.